This week our theme comes from Flowerdisco !! Hop on over to Audrey's BLOG to enter your card!! A new family member...a new focus (for now)! The good news is ~ she is going to the "spa" for a facelift and WILL be back!! The not so good news is ~ I am a Guest Designer 3 times in the next two weeks and only had one project completely done and photographed. The other two are waiting in my files (thank goodness I saved my files to my computer!!). Just waiting for my return label ~ UGHH!! 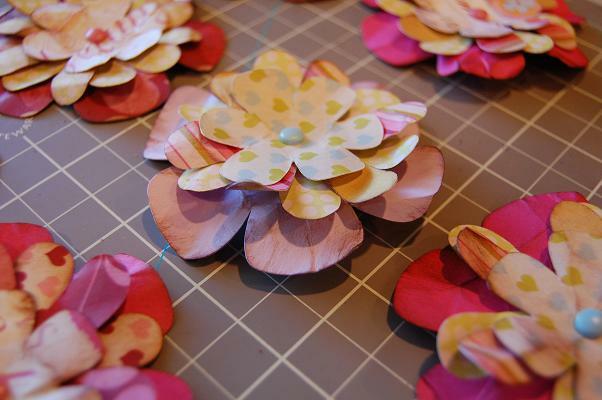 I have been playing with some alternative projects but goodness the time and paper I am wasting!! The ironic news is ~ I have been worried for some time that my E would die on me in the middle of a project. My E is 2 1/2 and gets a lot of use. I also transport her back and forth when I work at Michaels. I prefer mine over the store's E. So, if my E dies on me I will be forced to pay whatever price I need to in order to get one fast. So, I finally bit the bullet after watching sales for sometime. I ordered the blue E and it arrived on Wednesday the day AFTER my G dies!!! How ironic is that?!? I got her out of her box and turned her on. Guess what I forgot?? Yep, I needed a cartridge DUH!! I packed mine up a while ago and had to go get them. I also just pushed cut ~ forgot to load the mat!!! Yikes I am out of practice! I am sure wasting a lot of paper now that I can't see the real size of my images, but at least I have something to occupy my time until my G comes home!!! I am just sick!! My Gypsy screen has a crack in it and has to go to PC. I am telling her she is going to the "spa" so don't ruin the surprise for her!! I took off her pretty outfit and she looks so skinny and naked!! I carry my G in my purse all the time. I have been doing this since November, before that she was in my hands (he he). I have been super gentle with her when plugging her into the cricut and the charger. I have protected her screen and her body. Hindsight is 20/20 and I should have bought her a separate purse or carrier. Gee maybe I should have used the quilted one that Vivian made for me!! Old habits are hard to break!! Last night I saw the crack and I think my heart stopped for a minute! Well, I was so sad this morning that one of my daycare moms asked me if I was ok. I told her about my Gypsy screen. She is bummed for me as I have used my G to help her with a school project now and then (she is a teacher). So, I call PC today and fully expect to have to pay for the repair. After all, I broke the screen ~ it was not a defect. The PC service rep told me she thought it was covered. As she was checking she noticed some email correspondence (my ongoing feedback from the test) and asked if I was a tester and if I sent in an email about my cracked screen. I said that I did ~ to let PC know I would not be of any help until my screen was fixed. After she put me on hold, she told me to pack her up and they would get her fixed up ASAP so I could continue to help test!! After all I have done to help PC sell 30+ Gypsys (at Michaels) and my tiny role of testing, I feel like I am being repaid 1,000 times over!!! I am going to miss my G!! 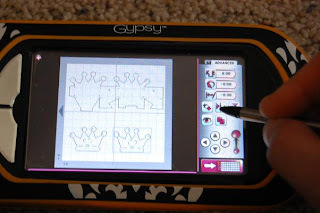 I might need to borrow one from a friend or even pick up DS since I don't remember how to use my Cricut without my Gypsy anymore! I am so grateful to Pam for recommending that we save our files to our computer!! I did this recently so I will only lose about 3 files. I also am a guest designer for Sassy soon and I have already cut out that project and photographed my Gypsy screens!!! I might have to get creative for Pam's designer spot next month. Cross your fingers that my G comes back soon!! I went to a graduation party for a good friend's daughter who was also a part time helper in my home daycare over the past two years. She is going to NW Missouri State to study education. I wanted to get her something special to take with her to college. Her comforter is black, hot pink and white so I used that as my color pallet. I purchased some plastic storage tubs in clear and hot pink. I also found a dry erase board that is a mirror and a photo board. I picked up a few odds and ends as well. I started with hot pink and cut out an A for Allison and a butterfly to stick on the clear tub. 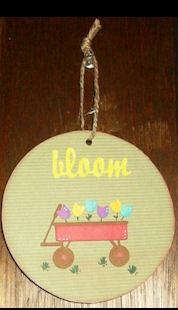 I used Nursery Rhyme for the font and Home Decor for the butterfly. 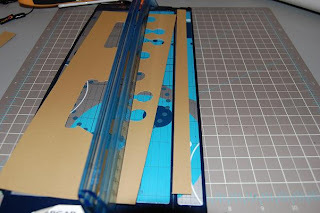 When cutting vinyl, set your blade to 3. 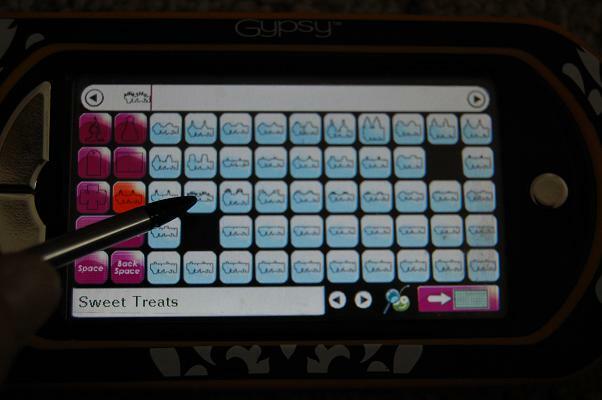 If you are not using a gypsy, set your pressure and speed to 3 as well for a kiss cut. A kiss cut is where the blade cuts through just the vinyl, not the backing. After you cut your vinyl, you need to weed the extra vinyl away. 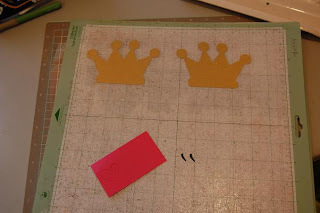 To do this, I use my Cricut dental tool. Once you weed the extra vinyl away, you need transfer tape or clear contact to pick up your image and transfer it to your project. I use my scraper tool to burnish the vinyl onto the clear contact paper. 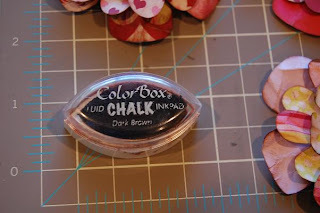 Cindy McVey taught me to "lint up" clear contact paper so it is not too sticky. You just wear your favorite pair of jeans and stick the contact paper to your lap a couple of times. This is similar to playing patty cake with your brand new cricut mats to get some of that stick off!! 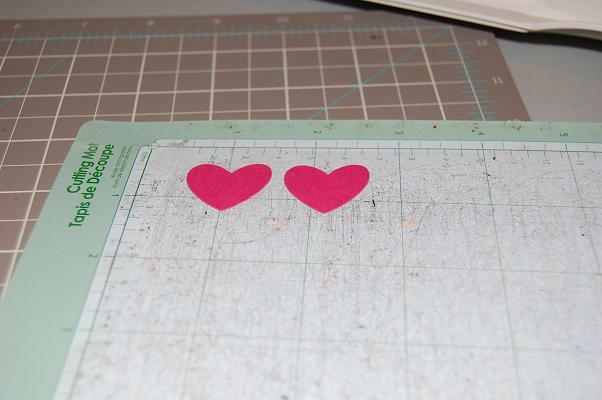 Very carefully pull contact paper off of the vinyl backing and then smooth it on your project. Then I use my scraper to burnish the vinyl and carefully peel the contact paper off. Here are the rest of the items I personalized with vinyl. I am kicking myself for not taking a photo of the gift all put together!! I decorated two large pink containers and 2 medium pink containers. I did have a bit of trouble getting the vinyl to stick to the memo board (I hope it stays!!) but soon it will be filled with photos! I added a set of plastic buckets that are good for bathroom totes or small personal items. I put some things my son needed for his dorm room (tide pen, air freshner, hand sanitizer, clorox wipes, etc.) along with some tissue paper and the card. She loved it! Here is the theme for Designer Showcase #8 over at Audrey's BLOG. My good friend Sassy is having a contest to win Lovestruck. She is asking for a project about summer love. This is my 12th year as a competitive Baseball Mom. My boys are technically the competitive ones ~ and I will just leave that thought alone!! One of my daycare boys (who has an older brother who plays high school baseball) was wearing a shirt the other day that inspired this project. I got my gypsy out and went straight to the Baseball Solutions Cartridge. While the kids were playing in the backyard, I played around with the sizing of home plate and the baseball bats. I used the shadows of the baseball bats. First I put one bat right in the center of home plate straight up and down. 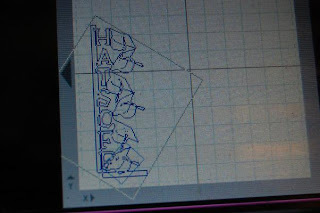 I duplicated the bat (to keep it the same size)and put it on the right side of home plate. I made the outside bat next. I used the rotate button to get the angle of the bat on one side and then duplicated the bat and flipped it sideways to get a mirror image. I repeated this for the middle bats. I only used 5 bats since mine are thicker than the bats on the t-shirt. I added the baseballs. Instead of "Grand Slammers" I used "Titans" since it fit better and is the name of my son's team. I used Don Juan for the font. I originally wanted to use different colors of bats, but the only feature of the baseball cart I don't like is the image ~ not the shadow or base but the image on top. This looks ok when you cut out a baseball player, but the bat only looks good if you want a wooden bat look. If you don't have a baseball player, you probably don't understand how important the color of your bat is!! I did not want to use wooden bats ~ no one uses wooden bats at this age unless you sign up for a wooden bat tournament or fall league. Well as you can see by this photo ~ the colored bats just don't do it for me. I kept the silver metallic bat and made four more. Now, as usual, I get these great ideas and then can't decide what to do with them!!! This is why I have tons of files on my gypsy waiting to be cut LOL!! I decided to put this on a box, so I used the Crayon Box from Tags, Bags, Boxes and More. I sized the box to fit the image, then cut it out. So, here is my Summer Love project...hope you love it too!! I have been busy making a baby scrapbook for my friend and her baby Izzy. 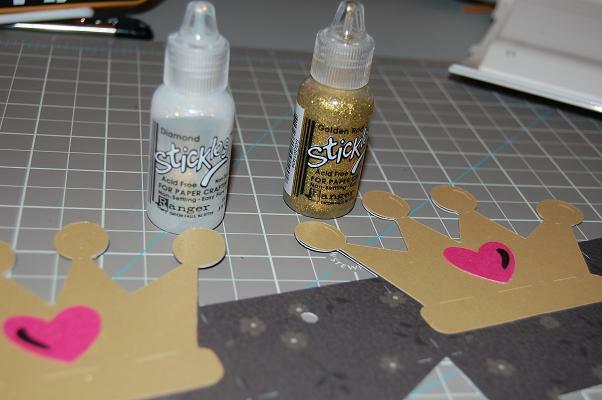 This is a new way for me to scrapbook because I am making the book for her first year ahead of time. I usually pick my paper to coordinate what is in the picture ~ clothing colors, background, etc. I bought a baby girl pad of papers at Michaels along with some solid pink, orange and green papers. I made all of my photo mats 6 1/4 x 4 1/4 so all mom has to do is stick down the photo. I positioned some of them horizintal and some vertical. I also put a pocket for a tag on each page so mom can journal on it. I put in a 2 page layout for Grandparents, cousins and Firsts. I used the font from Nursery Rhymes ~ my new favorite font!! I am showing a couple of pages here! I made pockets for the tags. Mom can put a small photo on one side and journal on the back. I included a list of suggestions to use (first tooth, roll over, crawl, haircut, etc.) and I have extra tags for her just in case. This was a fun project but it really stretched my brain! This week, Team Fairy SHERYL came up with our theme for the Designer Showcase over at CuteandSome! Her theme is using a CD or a circle as your project. If you don't have a CD lying around, you can make a circle out of chipboard, a cereal box, etc. Here is her sample! Isn't it lovely? 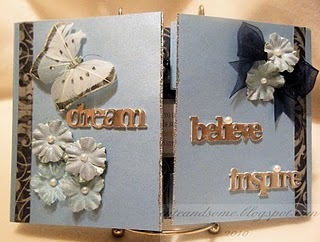 Just create your project (card, wall hanging, layout, mini album, altered item, box, etc. )and click the link above to enter it into our showcase!! We'll be seeing you! This is why I love teaching Gypsy classes!!! One of my Gypsy students made this gypsy cover for me!! Her note included with the cover said: "Lori, I feel I need to apologize for my absence for several weeks. I really enjoy your Thursday Night Classes, but have been unable to come. With summer quickly approaching I find myself still unable to attend, but want you to know how very much I enjoy your enthusiasm and knoweldge about the Gypsy. You are so willing to teach, and share with us, showing much patience." She went on to say that she is still trying to make the word book we started in class last month and she is still continuing to learn more about her Gypsy. She said her sewing skills are better than Scrapbooking but she enjoys both. 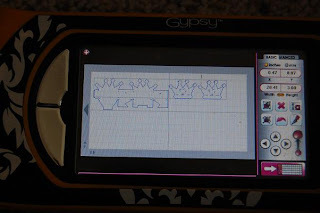 She was excited to learn how to cut fabric with the cricut and made a Gypsy cover for herself. She wanted to make one for me as well. She used the Gypsy, Cricut and Create A Critter to make this cover. The back includes a pocket for the charger and a stylus. She included a stylus ~ she was in class with me the week I dropped and broke 3 styluses!! I was so touched that Vivian took the time to make me this cover and drop it off at the store. This is why I love teaching!!!! 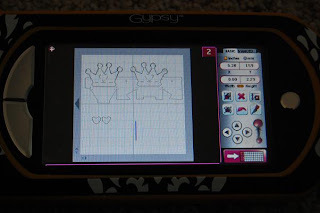 This week's challenge on the Gypsy Chit Chat forum of the Cricut MB is Mix Em Up. You use 4 carts, 4 welds and at least of of the images is a shape. I designed this border for my son who just turned 15 and is learning to drive. I welded letters, numbers and shapes from Designer's Calendar, Base Camp, Lyrical Letters, Cuttin' Up, Locker Talk, Street Sign, Doodletype, Going Places and Just Because Cards. 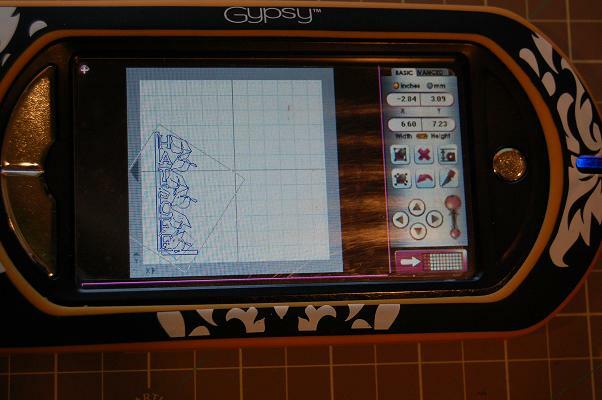 I wanted my border to be 2" x 12", so I put the images on a 12 x 24 mat on my gypsy. I started on the second inch in from the left edge and went to 13 inches from the left edge. 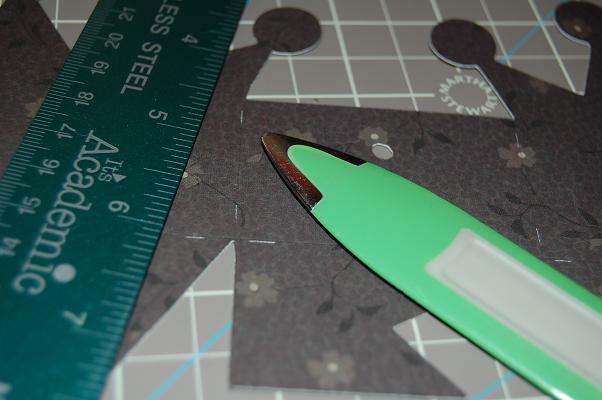 I put my 3" x 12" paper on my 12 x 24 mat to cut. I learned this technique from Alicia Garcia's BLOG. 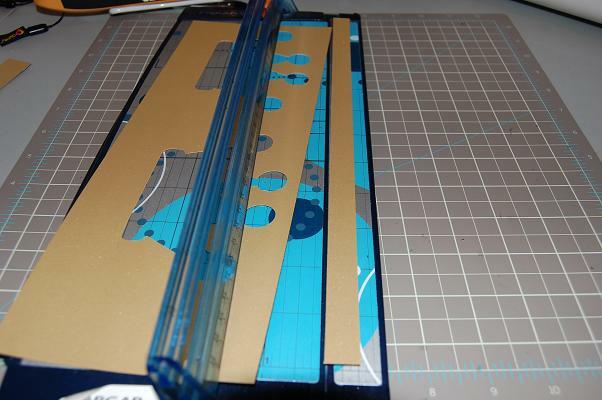 I used this blue paper to test cut my design. I will use red or dark blue on a layout (I am behind in his scrapbook since becoming a "girlie" designer lately ~ LOL)! I put the title on a piece of red paper so it would be easier to see. A while ago I made a mesh of the number 15 and the word "fifteen" that was 9" x 12". I have not yet cut it out, but I think I like this border much better!! First of all ~ Happy Mother's Day to all of the moms out there. Those of you who have chidlren, pets and yes even gypsy girls!! To the rest of you I hope you are having a wonderful day with your moms (or thinking about your moms)!! We had a nice brunch with family and then my oldest boys (including the hubby) helped get my drilled rock bubbling again and we cleaned out our bonus room. My oldest is back from college and has moved home for the summer. I have one week of free labor until his job starts. The list is growing!!! Tomorrow is also the first day of our new Designer Showcase over at Audrey's BLOG. I am one of the Team Fairies and this is my week to share a sample for our theme. I wanted a theme that would be easy to follow ~ especially for those of you who are participating in other challenges and contests. This is my birthday week, so I went with my two favorite colors PURPLE and GREEN (you can use one or both) and a FLOWER. The project can be anything: card, layout, altered item, fabric, etc. Once you create your project, you have until Friday at 8:00 p.m. to post it. Hop on over and check out Audrey's blog!! Our goal is to help you showcase your projects to a larger audience. You will get some blog love and could get a blog award if your project is chosen!! Here once again is my sample. I wanted to share with you the flowers that my daycare kids made for their moms for Mother's Day. I cut out the flowers using Plantin Schoolbook. I used double sided paper as well as cardstock. The kids crumpled up the flowers by themselves. 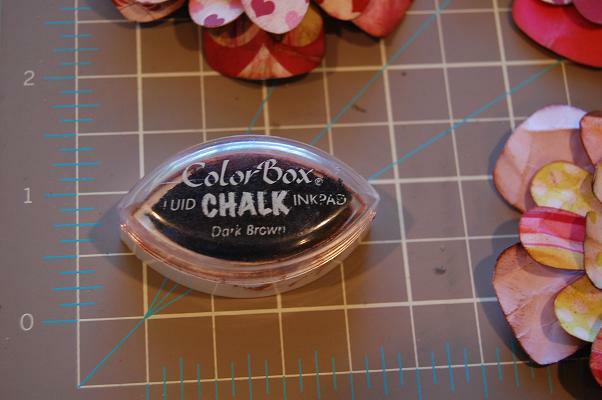 I inked the edges with liquid chalk and then assembled them with brads. Can you tell which one is mine? The children were very proud of their flowers! I was asked by one of my Gypsy students from Michaels to make this. She saw a die cut online but it was only offered in black. She wanted something that we could design on the gypsy and cut out in other colors. 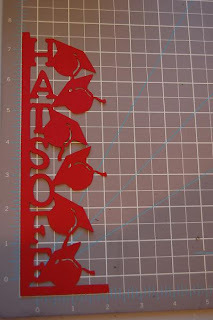 I chose red because my son's preschool graduation cap is red. I used George for the rectangles. I made one 0.3 width x 8.0 height and the other at 0.3 width x 2.5 height and welded them at the corners. 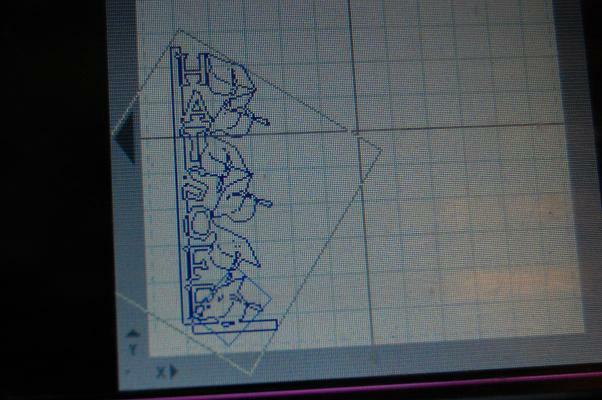 I used Plantin Schoolbook for the letters and A Child's Year for the graduation cap. There is also a graduation cap on Paper Doll Dress Up, but the tassel is separate. I used the rotate button to twist and turn the caps. I welded the letters to the rectangles, then welded the caps. Once you weld everything, you can change the overall size of the cut from the Basic Menu if you need it bigger or smaller. 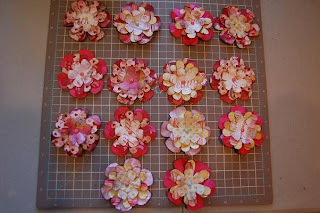 This is just one more example of how I have saved money on buying embellishments by using my gypsy instead! I am a Guest Designer today for Sassy and I made this Princess Box from the Sweet Treats cartridge. 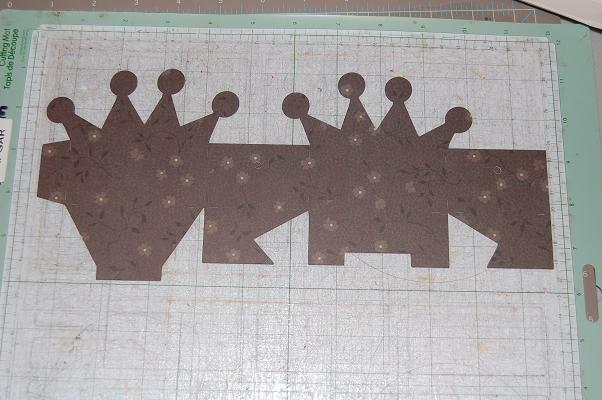 I opened a 12 x 24 mat on my Gypsy and grouped the box & crowns and sized them 3" tall. I ungrouped them and moved the crowns under the box on the mat. I changed the size of the mat to 12x12. I added a second page and copied the crowns onto it. 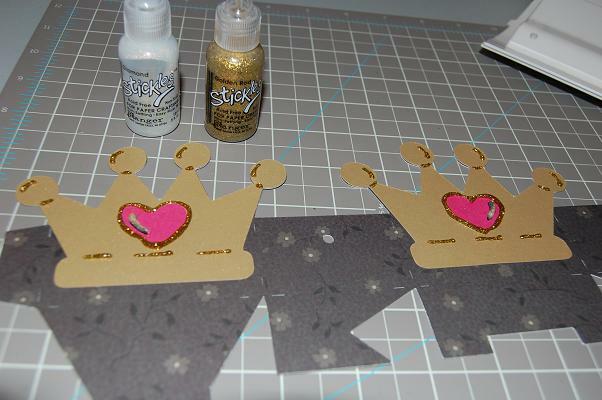 I flipped one crown (side to side) and added the hearts and swooshes sized to 3 inches. I cut out the box using double sided paper from a Heritage style of paper that I bought a long time ago. One side is black with small grey and white flowers and the other side has words and signatures (from mail) in creme, black and gold. 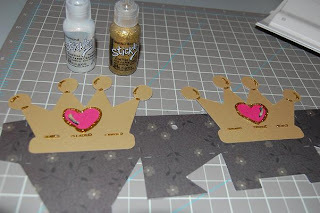 I used a metalic gold paper to cut out the crowns and the handle. I cut the heart out of hot pink and the swooshes out of black. My pink paper did not stick the first time. I made sure my file was saved THEN I deleted everything from the page except the hearts and re-cut. I did not save these changes. 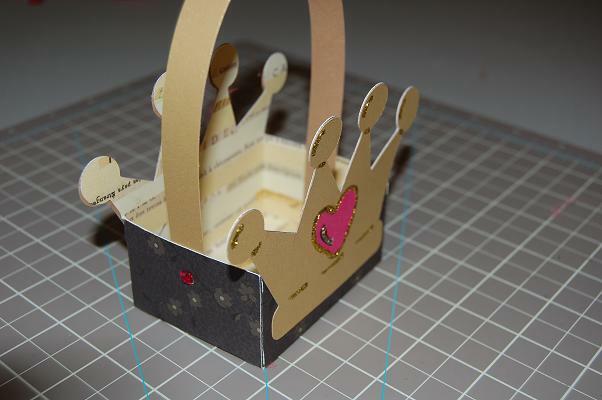 I scored the box but kept it flat so I could glue on the crowns. 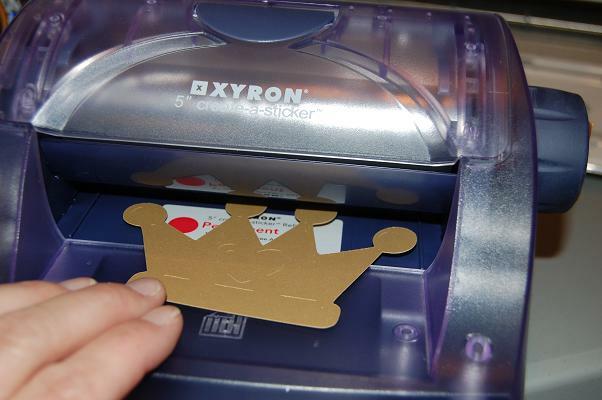 I ran the crowns through the xyron and stuck them on the box. I used Golden Rod stickles to add details to the crown and outline the heart I used diamond stickles on the swoosh. I originally planned on using hot pink ribbon for the handle. The ribbon would not stay up and the gold paper looked better, so I switched. To cover up the hole on the side of the box, I put a hot pink gem. 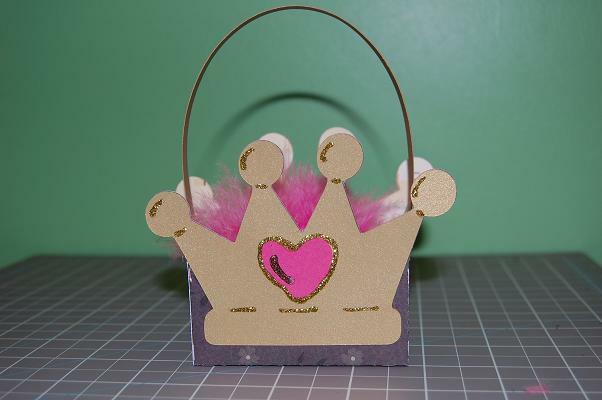 I added part of my hot pink boa inside the box, since that was my inspiration for using pink instead of red. Many of you know I have all boys (dirty, stinky boys ~ he he) and I don't make many sparkly, feathery projects. This was fun!